OK, so I had a minor fall with my bike yesterday and now it sounds like starter is bad. All I get is a click when hitting the start button. Back story, I was backing my bike out of the garage yesterday morning, down a slight downhill grade, when my left foot slipped on the wet grass and the next thing I knew, I was on the ground with the bike on it's left side. I had the engine running when this happened and I hit the kill switch when I realized it was still running on its side. Luckily it is grass and light gravel where I was at so nothing except my pride got hurt! But after I got the bike upright again and hit the starter, Click was all I got. I figured it might have vapor locked and I looked at it after I got home, same thing. I even pulled the plugs, no go. Now I can't believe the starter that I replaced last year has gone out again? Check for a hydrolocked cylinder, with bike on it's side you may have filled a cylinder with gasoline. Remove the spark plugs, cover the holes with a shop rag and hit the starter. If there's gas in a cylinder it will come shooting out. You need to see if the engine will turn manually. Put it on the center stand, in gear and try to turn the rear wheel or just try pushing it with it in gear, 2nd or higher. Clicking solenoid but no starter action. If you can activate the starter directly, you can begin to eliminate things. If starter fails to turn then you have inadequate current. Battery may have a damaged cell from the fall. It may register 12.6 volts at rest but little current. Voltmeter across battery terminals and measure with starter activated. If starter turns, then track wiring for poor connection. Thanks for the help so far. I have already pulled the spark plugs and there is still no starter action. I didn't have time last night to check the battery. It was a gentle fall, not a hard one, so I don't think that the battery has issues, but it is the same one that I got with the bike about 3 years ago, so it is a possibility. I will have time tonight so I will trouble shoot more. sounds a lot like an electrical issue. There is a solenoid of some sort (don't have my manual handy) on the tear side of the battery, right by the main fuse. Try wiggling that solenoid. Mine does that the odd time, give it a bit of a wiggle and works fine. Check all your main battery connections - positive and negative, plus the earth lead. Make sure they are all clean and tight. Possible main fuse if original could be a bit suspect - may as well check that. Hydrolocked- I wouldn't think so unless you left it laying on its side for a few hours. Last check - if you can run positive power lead to the starter motor connection and see if that works as well. I will go over all of these things when I get a chance. I really hope it isn't the starter since it is a pain to get that one screw back in! Thanks again for the ideas, keep them coming!! OK, I finally had time to work on the bike. The battery shows 12.3V when you hit the starter button, so I do not think the battery has an issue. I checked the voltage at the starter and it is 12.1V when the button is pushed. I pulled the starter, took it apart, and the planar gears turn freely, and the armature will turn, so I don't think that is an issue. I think I found the nut on the alternator (right above where the starter goes in right?) but after pulling the plugs, it doesn't seem to want to turn even though it is a little tight in the area. Anything else I can try?? I really do not want to take it in to the shop.. 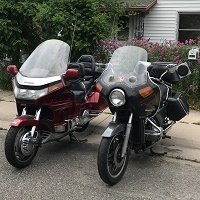 Disconnect the goldwing battery and use booster cables from your automobile To definitively eliminate the battery. Connect the cables to your starter to confirm it works. Note this grounds the motor with the cable. The remaining wiring is then to be addressed. If everything else in the bike works something is resisting the high current necessary for the starter. Confirm the GL ground is conducting. Cable from negative to motor to test. Then check the solenoid. Solenoid may be corroded despite “ clicking” , it may not conduct sufficient current. There is really nothing else in that part of the wiring diagram. You did take the cap off, 17mm? Then try to turn the 12mm under the cap? With it on the center stand rock the rear wheel with your right hand while shifting it up to 5th gear with your left then try turning the wheel to see if the engine will turn. Well finally figured it out! After changing the solenoid for a new one, I checked the starter I replaced last summer and it is bad. I pulled it out again and took it over to my truck with a set of jumper cable and sure enough, it didn't run.. Crud!! 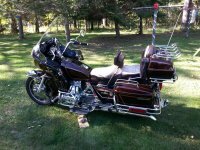 Oh well at least I think I will be riding again in about a week..
Yep I sure did,, That is what bother's me is everything looks good instide, Oh well now I will have a parts starter if I need them. When you jumped power to it did it spark like it was drawing current and trying to turn? How about the reduction gears in the other end, I've heard of aftermarket starters with cheap plastic gears... Any parts left from the starter you replaced last year? I did check the gears and they are metal and not plastic. When I hooked up the cables, nothing happened at all. I made sure I have power by slapping the 2 ends together and they did spark, so I am not sure what went wrong with it. The last starter has a story to it. The new one I got lasted about 2 weeks, and then quit working. My brother and I pulled it out and found out that one of the gears had 3 broken teeth on it. We took the old stater apart and used the god parts from that to fix it. There isn't much besides a few gears that are any good.